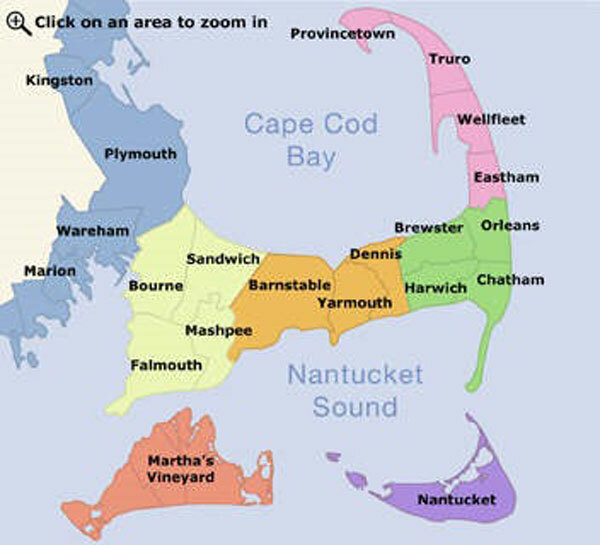 Cape Cod is an arm-shaped peninsula forming the easternmost portion of the state of Massachusetts. Although Cape Cod was originally connected to the mainland, the first Cape Cod Canal, completed in 1914, effectively transformed Cape Cod into a large island. While many people think of Cape Cod as a whole, it is actually made up of 15 distinct towns. All but one (Orleans) are named after their namesakes in England. From Provincetown at the tip of the Cape to Chatham at the "elbow" to Bourne at the Bridge, each town has its own unique character. You’ll find information on the individual towns below. The Pilgrims were the first “tourists” to visit Cape Cod, landing in Provincetown and later coming ashore at Eastham’s First Encounter Beach, named for their first encounter with the Nauset Indians. For more on the history of Cape Cod, click here. Today’s Cape Cod lures vacationers seeking the finest in sandy beaches, quaint villages, great shopping, the freshest of seafood, and plenty of activities to round out your vacation. If the beach is “your thing,” Cape Cod is the place for you. This 65-mile long peninsula borders the Atlantic Ocean, Nantucket Sound and Cape Cod Bay, and also offers many salt water bays and freshwater ponds and lakes, providing a variety of waters for your enjoyment. If your group includes teens or sports enthusiasts, you may want to hit the beaches of the Cape Cod National Seashore. It’s located along the Cape’s Atlantic coast and is where you’ll find the “surf’s up.” Try surf boarding or boogie boarding – or just relax and watch the tide roll in! You’ll be closest to these beaches if you stay in Orleans, Eastham, Wellfleet, Truro, or Provincetown. The shore along Cape Cod Bay is for the little ones and those who enjoy a nice stroll to look for shells or sea creatures. While there is little in the way of surf, the waters are pleasantly warm, and low tide makes for good opportunities to explore the bottom of the bay. The entire northern coast of Cape Cod and the western coast of the “arm” front on Cape Cod Bay. So from Bourne to Provincetown, you’ll find a vacation rental near to these beautiful beaches. Nantucket Sound borders the southern shore of Cape Cod and also surrounds the island of Martha’s Vineyard and part of Nantucket island. You’ll find the Sound’s waters warmer than the Atlantic’s and the Bay’s, with a little more surf than the Bay. 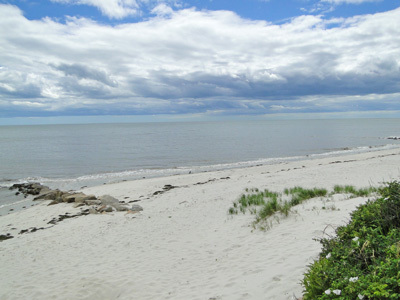 The Sound’s beaches lie along the southern shore of Cape Cod from Falmouth to Chatham. When you are on the Cape or Islands, don’t overlook the many nice beach settings on freshwater ponds. Notable are the Cape's largest lakes, including Long Pond in Harwich, Lake Wequaquet in West Barnstable, and the five lakes at Nickerson State Park in Brewster. The Cape and Islands also offer abundant fishing and shellfishing, and wooded areas in which to observe and enjoy nature. Boating is a popular activity, whether you prefer power or sail. The Cape Cod Rail Trail is enjoyed by bikers and walkers alike. You’ll find that the main streets of the towns on the Cape and Islands are lined with quaint shops and waterfront restaurants along with a wonderful representation of the arts, from paintings by renowned artists to performing arts featuring some of entertainment’s biggest names. No wonder Cape Cod is such a popular vacation destination! If you access Cape Cod over the Sagamore Bridge, you’ll be on Route 6 heading for one of the Cape’s three unique areas: the Upper Cape, the Mid Cape and the Lower/Outer Cape. “But wait,” you might exclaim, “if this is Cape Cod, what’s that huge, thatched roof building sitting alongside the canal?” The structure in question is one of many themed buildings which house The Christmas Tree Shops throughout Cape Cod and is, in fact, considered the largest thatched roof structure in the world. For many vacationers, this is the last stop before heading home – The Christmas Tree Shops being a magnet for bargain hunting shoppers. Route 6 is the “new” highway running through the center of the peninsula, from Bourne to Provincetown, off which 12 exits take you to its communities. The absence of development along this road is striking to the first time visitor – and welcomed by those who return year after year -- as it signifies Cape Codders are stemming what could easily be a runaway tide of development. Route 28 branches off to the south once you travel over the Bourne Bridge, running along southern Cape Cod, frequently within sight of Nantucket Sound. This route takes you to the southern communities of the Upper Cape region and winds eastward through pretty villages, past fishing boats at moorings in beautiful natural harbors, through the Cape’s one true metropolis, Hyannis, and ends at Orleans in the Lower Cape region. Route 6A was the original route onto which traffic from the Sagamore Bridge fed to take vacationers east to the Mid and Lower/Outer Cape regions. Along this scenic route are the historic northern communities of the Upper Cape and, in fact, all along the way from Sandwich to Orleans, you’ll see historic homes and inns, quaint antique shops and sheltered harbors – glimpses into Cape Cod’s varied history. The majority of vacation rentals on Cape Cod are single family homes and cottages, although condominium complexes are plentiful in the Mid Cape region.